I stood in front of the gates to his long driveway. The £5m house, inside a two acre walled garden, was huge for a one-parent family (with no family), but I smirked with satisfaction at the fact that the council had forgotten to take down the sign. When I was growing up my mother always instructed us never to speak ill of the dead. Why should we not speak ill of the dead? Well, clearly they are in no position to defend their reputations. But, often, neither are the living able to defend themselves, and certainly not their reputations the dispossessed of this earth, should they hail from Ballymurphy or the Bogside. Who was there to speak out for Fr Hugh Mullan, Frank Quinn, Noel Phillips, Jean Connolly, Danny Teggart, Joseph Murphy, Eddie Doherty, John Laverty, Joseph Corr, Paddy McCarthy and John McKerr? Surely former merchant seaman Gerry Fitt, the skipper of the SDLP and MP for West Belfast, would attest to their innocence and hound the killers of his constituents? Those eleven innocent civilians were murdered by British paratroopers in Ballymurphy during the introduction of internment. As Paras kicked in doors, wrecked homes, made arrests, began shooting those who were in their way, the weather forecast was the most important thing that morning, Monday, 9th August, 1971. The weather forecast? Yes, it is what preoccupied the mind of the skipper of Morning Cloud as the English team made the exciting return journey from Fastnet Lighthouse to Plymouth, in the prestigious six hundred mile yacht race. It was a glorious finish! There were cheers from the crowds of onlookers as the skipper steered the British Admiral’s Cup team to victory at the helm of his 42-foot yacht – the cumulative length of at least seven of the coffins of the Ballymurphy victims whose funerals were just beginning. Months later, the skipper’s Paras would go on to shoot dead thirteen people in Derry protesting against internment. This was a bit embarrassing so he appointed his Lord Chief Justice Lord Widgery to have a look at things and explained to him that “it had to be remembered that we were in Northern Ireland fighting not just a military war but a propaganda war”. In response to internment the SDLP called a rent and rates strike, joined in civil disobedience, participated in ‘illegal’ marches, and said the party would not enter into talks with the British until internment ended. After Bloody Sunday its deputy leader declared that it was now “a united Ireland or nothing”. And yet a few weeks after Bloody Sunday two old drunken sailors sat in 10 Downing Street, downing whiskey into the early hours, clinking glasses and singing their hearts out. Gerry even played his harmonica and sang ‘Danny Boy’ (the ‘Derry Air’). There was no talk of the Falls Curfew, the Ballymurphy Eleven or Bloody Sunday. Yes, Gerry Fitt and Ted Heath had a whale of a time. 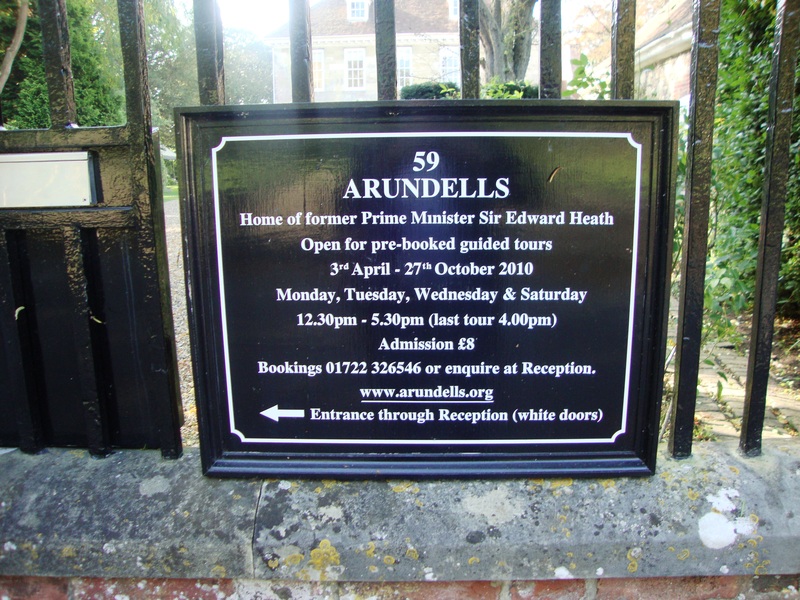 In 1985 Ted Heath bought Arundell, his splendid house in Salisbury’s Cathedral Close. His express wish was that after his death the house would be turned into a museum. He was so popular that sixteen of his near neighbours objected and originally the council supported them but the trustees got their way and the house was opened to the public in 2008. As a passionate teenager, incensed by the curfew, internment and the killings on Bloody Sunday, I remember writing in my diary thoughts of assassinating Heath and his Home Secretary Reginald Maudling. A few weeks ago I was in the Salisbury neighbourhood for the wedding of my niece. And now I stood in front of the gates of Ted Heath’s long driveway and smirked with satisfaction. The large queues of fans snaking around Cathedral Close had never materialised. It hadn’t enough visitors, wasn’t viable, had to be closed and was to be put up for sale. But they had forgotten to take the sign down, asking for £8 per visitor on any Monday, Tuesday, Wednesday or Saturday afternoon! Back in 1972 we had no idea that our MP, the leader of the SDLP, was partying with the man responsible for killing his constituents, but in retrospect you can now see that it was all in character for Fitt and what came next, his support for Thatcher during the H-Block hunger strikes, and his elevation to the House of Lords after the people of West Belfast voted him out. Both men died within weeks of each other: Heath in July and Fitt in August 2005. “At a news conference shortly after his arrival at Plymouth, Mr Heath refused to discuss Northern Ireland, saying only that he had been kept closely informed of events by radio link. “It was left to his press officer, Henry James, to explain that all decisions on the government’s course of action had been taken before Mr Heath sailed. He said the prime minister went on board the Morning Cloud as planned to avoid raising the alarm that something unusual was afoot.